This is Beyond Valor... a tense game simulation of tactical combat on the Russian Front so realistic that you'll duck with every roll of the dice. Yet it is more playable than its famous predecessors - Squad Leader and Cross of Iron. 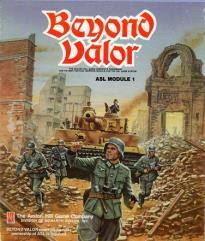 In combination with ASL, Beyond Valor opens new vistas in the realm of tactical combat simulation gaming.